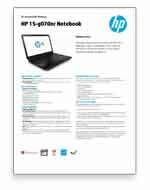 Make on a regular basis computing easy with the HP 15-g070nr Notebook. This dual-core powered, affordable notebook gets the job done with reliable performance on the road or at home. View photos, videos and more on a 15.6-inch diagonal HD display. Sync photos across your mobile devices the use of HP Connected Photo. Plus, combine your music collection with new discoveries the use of HP Connected Music. Use HP SimplePass to access your online accounts fast and help keep your identity protected, too. All your memories. All in sync. Multi functional place.